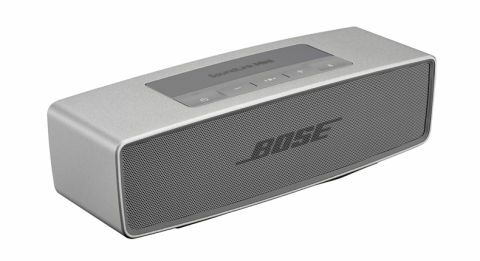 Bose SoundLink Mini II review | What Hi-Fi? At just 5.1cm tall, the Bose SoundLink Mini II truly can be described as “palm-sized”. It is a fairly heavy baby, however. There is no sign of flimsiness or fragility, and we're fans of the clean design. Our review product is a smart two-tone grey – though we think the black alternative is equally slick and covers are available if you fancy something more jazzy. External features are kept to a minimum; there are the usual buttons for power, pairing (you can link two devices at a time and switch between them) and volume. There’s also an almost incognito pair of jacks on the side for USB charging (ten hours maximum claimed life) and auxiliary input. Beneath the shell is what Bose describes as “an innovative driver configuration”. Not only does it provide much of the bulk, it gives a fuller, more bass-heavy sound than you might expect from a speaker this size. Sounding bigger than you are is not an uncommon aim in this field, but the key is getting that low end balanced and taut. That is what we are yet to hear, especially at this price. That extra depth is immediately clear as we play Jose Gonzalez’s Heartbeats. Both nylon-string acoustic guitar and vocal are exceedingly rich, offering the warmth of a winter's night by an open fire. There's an impressive amount of space too, letting each part breathe and offering an extra dimension to the doubled vocal. The dynamics are subtle but pleasantly expressive. Testing the agility of that bass with more weighty tracks such as Future Islands' A Dream Of You And Me, we're left in two minds. There's a very bass-heavy balance that removes that element of space and a great amount of the detail present in emptier tracks. But it isn't altogether boomy or distorted – it does as good a job as anything we've heard at this price and stature. Of course it struggles a little more with songs that are busier or more coarse in the low end, but, even when we play Queens Of The Stone Age's A Song For The Dead it doesn't become a difficult listen. What the SoundLink Mini II does well – adding greater stability and richness to the mid and treble frequencies in acoustic tracks – is immediately undermined by the fact it loses all that as soon as you add a bass guitar or similar. We'd prefer to sacrifice some of that warmth and bass weight for better detail and expression across the board. Still, if there is a market for tiny speakers with more than their fair share of low end, Bose have made one that stands up to its rivals, many of whom lose all sense of composure with tracks such as some of our test tracks. If you’re in that camp, you'll probably be taking a Mini II home. If not, we'd suggest you compromise on price, size or frequency range, but not overall sonic capability and take a look at the Bose's closest rivals, such as the Ausio Pro Adddon T3 or the JBL Xtreme.